Among the Philadelphians who attended Phillies1 games in 1887 were magistrates, hotel proprietors, and city councilmen. Stockbroker Benjamin Johnson never missed a game; he “waves his hat and shouts himself hoarse” at the ballpark.2 John A. Forepaugh, manager of the Eighth Street Theatre, “smokes a dozen cigars in his nervousness every game.”3 Master Warden Robert McBride “loves the game passionately, and whenever he can get away from ‘the big house...’ he hies himself to the ball grounds.”4 And when the Phillies make a good play, Customs Appraiser George H. Hoffman yells until his face turns purple. 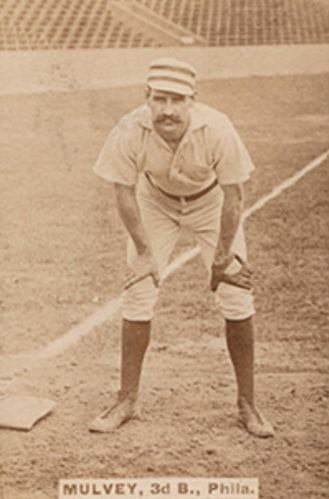 The Phillies, managed by Harry Wright, started the 1887 season slowly with a 26-32 won-lost record through July 9. But they were 24-8 since then, including victories in the first two games of a three-game series at home against the Indianapolis Hoosiers. Between 2,500 and 3,000 fans turned out for the final game of the series on Wednesday, August 24. Wright chose right-hander Al Maul, a promising 21-year-old rookie, as his starting pitcher. The Grounds were “wet and slippery from recent rains.”7 The Phillies batted first. George Wood led off with a triple to left-center field. Ed Andrews, batting second, singled to right field to send Wood home. After two wild pitches and a fielder’s choice, Andrews, too, came home. Tom Brown led off for the Hoosiers in the bottom of the first by drawing a walk. Jack Glasscock then grounded into a “brilliant” 5-6-3 double play, from Joe Mulvey to Arthur Irwin to Sid Farrar.8 The next batter, Emmett Seery, was hit by a pitch, and Jerry Denny followed with a double down the left-field line, scoring Seery. Charley Bassett’s single scored Denny. The Phillies got four more runs off Leitner in the top of the second inning on two walks, an error by Denny (the Hoosiers third baseman), and singles by Jack Clements and Andrews. Undeterred, the Hoosiers rallied for five runs off Maul in the bottom half of the inning on singles by Mert Hackett, Glasscock, Denny, and William Johnson; a double by Brown; and errors by Irwin and Farrar. Maul “was mauled out of the box” by this outburst, reported the Indianapolis News.9 Manager Wright replaced him with right-hander Charlie Ferguson, regarded by some as “the speediest pitcher in the League.”10 Maul remained in the game, however, as the Phillies center fielder, and Andrews moved from center field to second base, the position vacated by Ferguson. The distance down the right-field line from home plate to the outfield wall was 290 feet.11 In the fourth inning, Seery, a left-handed batter, tripled by driving a pitch from Ferguson off that wall. Denny singled to knock Seery in, and the Hoosiers led 8-6. But the Phillies took the lead by scoring three runs in the fifth inning. Andrews drew a walk from Leitner, went to second base on a balk, and scored on Mulvey’s single to left field. Mulvey stole second base and scored on Ferguson’s single to right. Errors by Leitner and Brown allowed Ferguson to tally the go-ahead run. The game was a pitchers’ duel after that. Each team scored a run in the seventh inning. Mulvey singled to right field, stole second base, and scored on Farrar’s single up the middle. Seery again tripled off the right-field wall and came home on a fielder’s choice. With two outs in the bottom of the ninth, trailing by a run, the Hoosiers pinned their hopes on Seery. He nearly hit a third triple off Ferguson, but his drive went barely foul. Ferguson then struck him out and the thrilling contest was over. The final score was Phillies 10, Hoosiers 9. The Phillies went 24-8 in the remaining games of the season, including a furious finish in which they won 16 and tied one in their final 17 games. But it was not enough to win the pennant; they ended the year in second place, 3½ games behind the champion Detroit Wolverines. “In Third Place,” Philadelphia Inquirer, August 25, 1887: 3. “Safe in Third Place,” Philadelphia Times, August 25, 1887: 4. “A Heavy Batting Game,” Philadelphia Record, August 25, 1887: 4. “Philadelphia Wins Again,” Indianapolis Journal, August 25, 1887: 3. “Base Ball News,” Indianapolis News, August 25, 1887: 3. Rich Westcott, Philadelphia’s Old Ballparks(Philadelphia: Temple University Press, 1996), 27-32. 1 Though Baseball-Reference.com refers to the team as the Philadelphia Quakers, period newspapers consistently referred to the team as the Phillies. 2 “Base Ball Enthusiasts,” Philadelphia Times, August 27, 1887: 6. 5 “Philadelphia News,” Sporting Life, August 31, 1887: 5; “The New Ball Park,” Philadelphia Times, May 1, 1887: 1; “Philadelphia Ball Park,” advertisement in the Philadelphia Times, May 17, 1887: 3. 6 “The National Game,” East Hampton (New York) Star, August 6, 1887: 1; “The National Game,” New Haven (Connecticut) Daily Morning Journal and Courier, August 30, 1887: 4; Jonah Johnson, “The Ball Club Trip,” Indianapolis News, August 31, 1887: 1. 7 Philadelphia Inquirer, August 25, 1887: 3. 8 Philadelphia Times, August 25, 1887: 4. 9 Indianapolis News, August 25, 1887: 3. 10 “The Season on the Diamond,” Wilkes-Barre (Pennsylvania) Sunday Morning Leader, December 11, 1887: 6. 11 Philadelphia Times, May 1, 1887: 1. 12 Philadelphia Record, August 25, 1887: 4. 13 Indianapolis Journal, August 25, 1887: 3. 14 Philadelphia Inquirer, August 25, 1887: 3. 16 “The Ball-Players,” Indianapolis News, April 11, 1888: 2.